The demand to increase energy efficiency in electrical products is driving the development of more accurate measurement instruments. Modern instruments now can quantify incremental gains made as improvements draw more work from each kilowatt-hour. Many electrical products today, particularly motors (Figure 1), already are working at efficiencies of 95% and better, so to improve efficiency is a challenging but important goal for manufacturers. The capability to measure small improvements calls for power analyzers that can deliver the precision and accuracy necessary to confirm these critical improvements in efficiency. If you are designing or testing electric motors, variable-speed motor drives, power inverters, UPS systems, appliances, consumer products, or other types of electrical devices, you may be required to choose an instrument to make precise electrical power measurements. There are many instruments available from a variety of sources, so it is important to understand the measurement capabilities of these offerings and how they relate to or affect the measurements you need to make. This discussion will review your options and explain how to interpret specifications since not all manufacturers define terms in exactly the same way. What does “typical” mean in this context when talking about watts? This term often is misleading. Typical values usually are a reference value based on what a manufacturer expects from its product. In practice, it can be translated as “usually but not always,” “maybe,” “perhaps,” or “possibly.” It is deliberately vague, because typical accuracies are neither guaranteed nor traceable to a national calibration standard or accredited calibration-laboratory standard. Do you want your company to base product performance on typical values or make a purchasing decision based on typical performance specifications of a product? When selecting a power measuring instrument, check that the published accuracies are guaranteed and not just typical values. Another potentially confusing factor on many datasheets is measurement range. It is important because the specified accuracy of a power-measurement device varies depending on where the measurement is within the range. Generally, measuring devices of all types lose accuracy when working at the highest and lowest ends of their range. Therefore, an accuracy value should specify the range over which it is valid; otherwise, you don’t know if it is valid just at one voltage and current, at several points over the scale, or over the complete range. As an example, a manufacturer might say the specified accuracy is valid from 1% to 130% of the measurement range. This suggests a high confidence level for accurate readings from one end to the other. Another may say it is valid only when reading in the middle third of the range. Such a device can still be useful if most operations fall in the usable range. If you are performing tests as part of compiling specifications for your company’s products, your product design and testing will need to comply with some relevant industry standards such as IEEE, CE, IEC, and MIL-STD standards. These stand­ards typically specify testing procedures, actual performance test limits, and results for various product types. These may include specifications covering the instruments permitted for use during internal testing. Use of the wrong instrument for power-related measurements can cause product design evaluation to fail applicable industry compliance tests. Certification could require retesting with the associated costs and lost time, all because the wrong measurement instrument was used. Power analyzers and power meters (Figure 2) have been used for decades in electrical product testing because they offer the accuracy, frequency range, and functions necessary to meet industry test and measurement standards. These instruments make true power measurements using matched voltage and current input circuits for each wattmeter. They have the capability to make single phase, three phase-three wire, and three phase-four wire power measurements. Their validity is assured with a NIST-traceable or ISO17025 calibration certificate with test data, but users must verify the availability of a calibration certificate when purchasing any type of power measuring instrument. Power analyzers and power meters come with a variety of measurement accuracies, frequency bandwidths, and prices to provide the best solution for the application while staying within budget. For high-precision efficiency measurements, high-end power analyzers can have measurement accuracy as high as ±0.01% of reading. Depending on the model, the specified power measurement frequency can range from DC to 1 MHz. 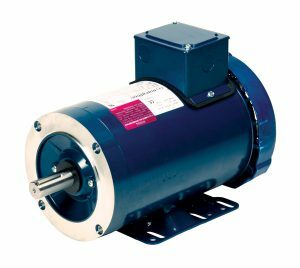 Electric motor testing typically is done in accordance with industry standards such as IEEE 112, NVLAP 150, and CSA C390—all of which specify testing methods and measurement instrumentation accuracy requirements. As an example, IEEE 112 and NVLAP 150 both specify power, voltage, and current accuracy to be ±0.2% of full scale or better. For electric motor and variable-frequency drives, including pulse-width modulation drives, power analyzers should have high-speed, high-resolution digitizers with digital windowing functions for accurate measurements of distorted and fluctuating waveforms. Some power analyzers also offer harmonic-measurement functions. The best solution is an instrument able to characterize harmonic data and total harmonic distortion (THD) simultaneously with normal power measurements. This makes it possible to complete test measurements quickly and easily. Compliance testing to IEC 62301, which includes both amplitude and THD measurements, can be performed by some power analyzers using simultaneous measurement of both normal and harmonic data. Some instruments also can provide harmonic compliance testing to IEC 61000-3-2. But just because a device can do an FFT calculation doesn’t mean it complies with IEC harmonic measurement requirements. Energy Star and standby power testing require low current and power measurements. Many instruments cannot make these low-level current measurements in the microamp range, and some cannot in the milliamp range. Users must verify that the instrument can make these low-level measurements accurately. Some instruments make provision for standby power measurements by using separate current connections, one for the low standby current range and another for higher normal operating currents. This is not an acceptable testing method because there is no means to make continuous product tests since moving from the standby mode to the operation mode requires a physical wiring change. Some digital oscilloscopes offer power measurement features and/or a PC-based power analysis software package, and most test engineers have a very high comfort level when working with oscilloscopes (Figure 3). They provide basic measurement functions from simple waveform analysis to advanced measurement solutions, but for these kinds of high-precision measurements, there are critical limitations. For instance, there are resolution limitations since most scopes only offer 8-bit vertical resolution, although more sophisticated designs can be 12-bit. Gain accuracy also can be a problem since most are no better than ±1.5%, and this is DC voltage accuracy only, not power accuracy. 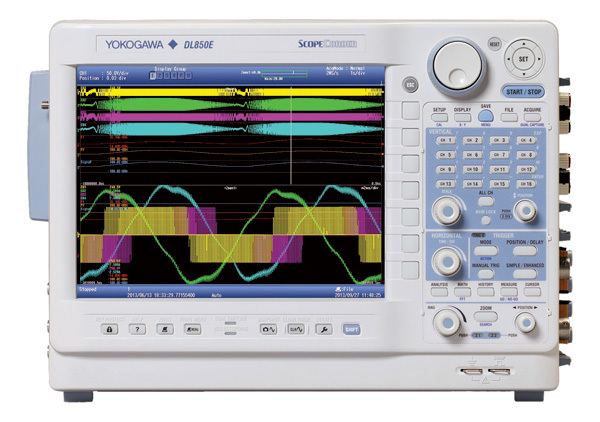 In spite of most oscilloscopes’ extensive high-frequency bandwidth capabilities, there usually is no AC power accuracy specification, and even with high-resolution units, the AC vertical accuracy is still undefined. Another drawback is ground referencing of the inputs, requiring differential probes for voltage measurements, which negatively affects overall measurement accuracy. To make AC power measurements, scope inputs must be isolated from ground, usually with a differential probe. These probes can be expensive and can add gain error of easily 1% or more, plus phase-shift error. Moreover, the overall voltage measurement accuracy will be unknown. Current measurements require a current probe or current transformer. These are convenient as they can simply clamp around the wire and provide isolation from ground. There are special probes with a millivolt-per-amp output designed to be connected directly to an oscilloscope’s voltage inputs. Still, extreme care must be taken as these devices also add gain error, some voltage offset, and even phase shift. Additional errors can result from not setting the proper probe-scaling factor in millivolts-per-amp and not setting the proper voltage range for the scope. All these factors add an unquantifiable measurement error to the overall measurements made by an oscilloscope. Finally, some digital oscilloscopes do not make a power measurement at certain phase angles so caution must be used when making power measurements. The bandwidth of a power analyzer will not match that of a high-bandwidth oscilloscope; however, the bandwidth of a high-end power analyzer usually is high enough to cover most power applications, which rarely exceed 1 MHz. To make power measurement calculations, many oscilloscopes simply multiply two DC voltage channels together. This yields a power measurement that is only a math calculation between two DC voltage input channels of the oscilloscope. This math function could be done with special firmware installed in the oscilloscope or by power test software running on a PC. This approach leaves the AC voltage, current, and power accuracy undefined. This calculated power value can be a useful reference but it will have unknown repeatability. All of these unknowns make an oscilloscope largely unsuited for serious performance testing. Even with those limitations, it is still a good tool for making reference value power calculations for applications such as board-level and circuit-component-level testing, along with timing measurements on circuits within products. Many data acquisition (DAQ) system and data recorder companies have developed their own power measurement and analysis software, with claims of offering a better solution than power analyzers or power meters. Once again, such statements can be confusing and misleading and could result in costly mistakes. DAQ systems and data recorders provide good solutions for many different types of measurement applications. They can mix various inputs such as thermocouple as well as current and voltage inputs. However, for electrical power, they do not provide a true AC power measurement traceable to a standard. Like digital oscilloscopes, these instruments typically measure two DC voltage inputs and use software to multiply the data to provide a power calculation. This creates the same limitations as described above for oscilloscopes. Some instrument manufacturers also provide a motor test software package for their data recorder. Since these instruments do not provide a voltage, current, or power accuracy specification, they cannot meet the requirements of industry standards such as IEEE 112. This standard defines the voltage, current, and power measurement accuracy for motor testing to be ±0.2% of full scale or better on AC circuits, so using a DAQ system or data recorder with undefined measurement accuracy is not an acceptable solution to meet this or similar standards. Other products, such as power transducers and power-quality meters, can provide true electrical power measurements. These instruments monitor electrical power lines and produce a DC analog output equal to the AC watts measured by the input. Input voltage and current ranges are designed to meet the secondary outputs of AC voltage and current instrument transformers, so voltage ranges of 120 V (85-135 VAC) and 240 V (170-264 VAC) are typical. Current range usually is 0 to 5 A AC. These transducer accuracies are based on the DC mA output. Standard watt transducers with a 0- to 1-mA output typically have accuracies of ±0.5% of full scale. High-accuracy watt transducers with a 0- to 1-mA output usually have accuracies of ±0.1% of reading plus ±0.05% of full scale. These instruments also typically provide NIST traceable or accredited ISO 17025 calibrations. The frequency range of these power transducers generally is 45 to 65 Hz, so the DC mA output signal must be connected to some type of digital or analog meter for readout. Therefore, the total power measurement accuracy stack-up is based on the power transducer accuracy plus the readout meter accuracy. Additionally, the accuracy of the voltage and current transformers also must be included in the overall measurement performance picture. So when power transducers are used for product testing, special care must be taken to consider all the measurement parameters such as accuracy, voltage and current ranges, and frequency range. Power transducers have the advantage of being compact, so they can fit into tight places and can even be installed inside the product and provide remote readout capability. Is measurement accuracy a guaranteed specification or just a typical value? Does the instrument carry a NIST or ISO 17025 calibration certificate? Does the instrument provide a true power measurement rather than a calculated value between two voltage channels? Is a measurement range specified within which the specified accuracy applies? Will the instrument make qualified power measurements over the required frequency range, such as DC to the kHz or MHz range? Is accuracy specified over the full frequency range? Can the instrument make the full range of measurements required by the relevant industry standards? There are many choices available for making electrical power measurements, and each approach has its advantages and disadvantages. Power analyzers guarantee accuracy specifications and can include a NIST or ISO 17025 calibration certificate, not to mention other advantages as detailed in this article. The right selection can make a major difference.